Background: L-glutaminase enzyme belongs to the family of hydrolases, those acting on carbon-nitrogen bonds other than peptide bonds, specifically in linear amides. Protein L-glutaminase, which converts amino acid glutamine to a glutamate residue, is useful as antileukemic agent, antiretroviral agent and a new food-processing enzyme. 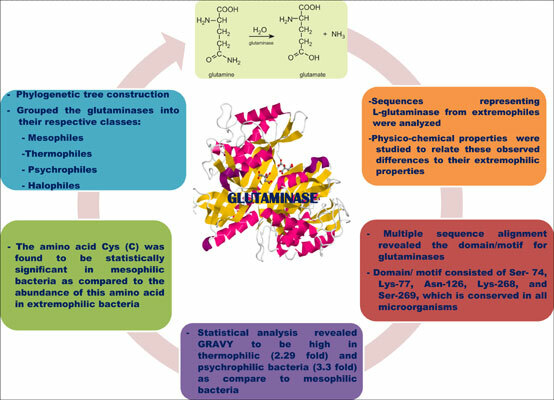 Objective: The sequences representing L-glutaminase from extremophiles were analyzed for different physico-chemical properties and to relate these observed differences to their extremophilic properties, phylogenetic tree construction and the evolutionary relationship among them. Methods: In this work, in silico analysis of amino acid sequences of extremophilic (thermophile, halophile and psychrophiles) proteins has been done. The physiochemical properties of these four groups of proteins for L-glutaminase also differ in number of amino acids, aliphatic index and grand average of hydropathicity (GRAVY). Result: The GRAVY was found to be significantly high in thermophilic (2.29 fold) and psychrophilic bacteria (3.3 fold) as compare to mesophilic bacteria. The amino acid Cys (C) was found to be statistically significant in mesophilic bacteria (approximately or more than 3 fold) as compared to the abundance of this amino acid in extremophilic bacteria. Conclusion: Multiple sequence alignment revealed the domain/motif for glutaminase that consists of Ser-74, Lys-77, Asn-126, Lys-268, and Ser-269, which is highly conserved in all microorganisms. L-glutaminase, leukemia, extremophiles, multiple sequence alignment, phylogenetic tree, amino acid.